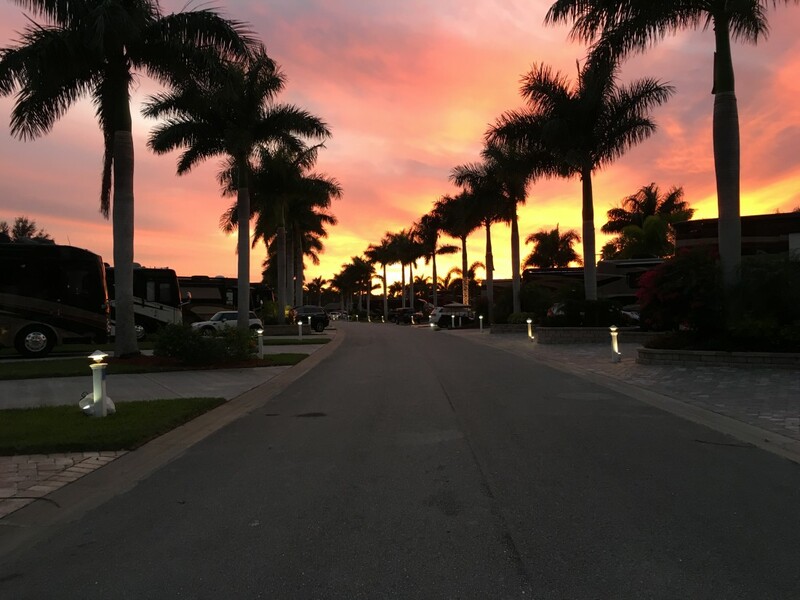 Other than beautiful weather more than half the year, one of the pleasures of living in Florida is the abundance of RV parks, campgrounds and upscale motorcoach resorts, all within a short drive of just about anywhere in the Sunshine State. Even better, if you have a flexible schedule and can travel with short notice, you’ll quickly learn that more times than not, it’s not that difficult obtaining a reservation in desirable parks…even those that may be listed as “sold out” online. 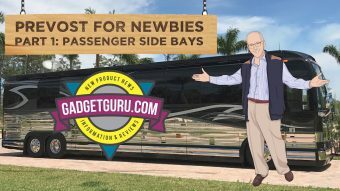 Based on my brief period as a bus owner I’ve learned that in many ways resorts and campgrounds can be compared to cruise ships as there are often last minute openings for those who can act swiftly. Using cruise ships as an example, if you live near a port and don’t require airfare to arrive at the dock, there’s often bargains available for last minute travelers. After all, cancellations happen for a variety of reasons and both the cruise ship operators, or in this case, the park managers, are happy to arrange a last minute reservation rather than have a cabin or a space go empty. Yes revenue is revenue. 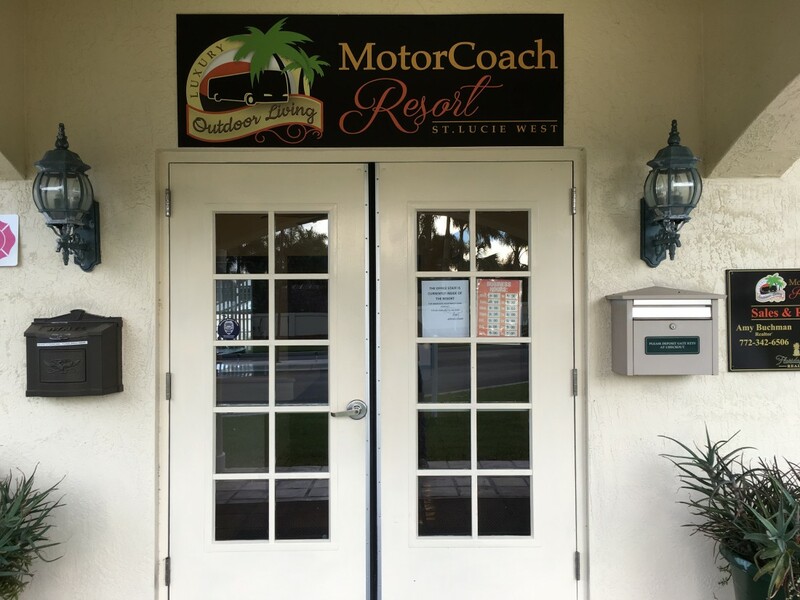 While peak camping season has arrived in Florida, after having a positive experience at the Jupiter Palm Beach Motorcoach Resort last week, I thought I would contact the MotorCoach Resort in St. Lucie West, FL to see if I could obtain a Friday night reservation in a premium lot. They didn’t disappoint. 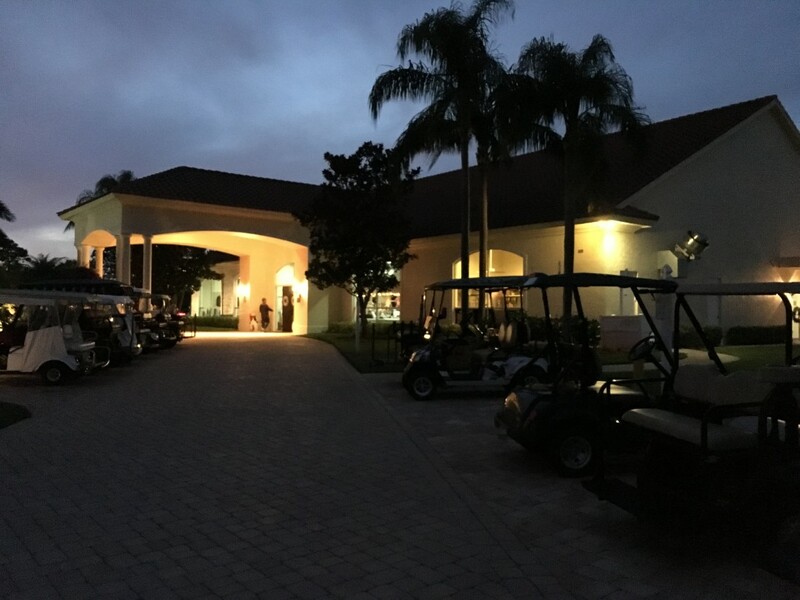 My sticks and bricks home is located an hour South of the Port St. Lucie (PSL) area and this resort is a perfect location for a last minute getaway. 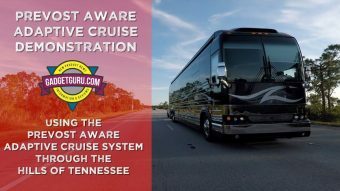 However, just like most upscale motorcoach resorts, there’s restrictions on the age and type of coach that can visit the property. I have no doubt that if I simply made an online reservation and stated I’ll be arriving in a 59 year old bus, my request could go unanswered. It’s becoming my method to include a link to an overview video of my Flxible Starliner in the reservation request form and simply asking they view the video before saying no. 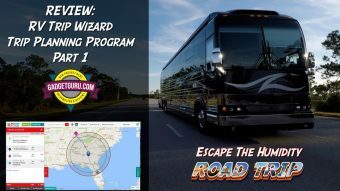 So far, this method has a 100% success rate and the Starliner has proven to be a welcome guest at even the most discerning of motorcoach resorts. 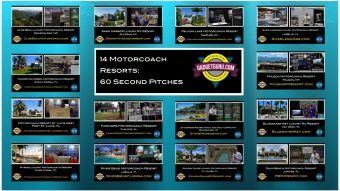 So on Friday, December 30, 2016, with Lucy the Dog in tow, off I went to check out this luxury motorcoach resort. 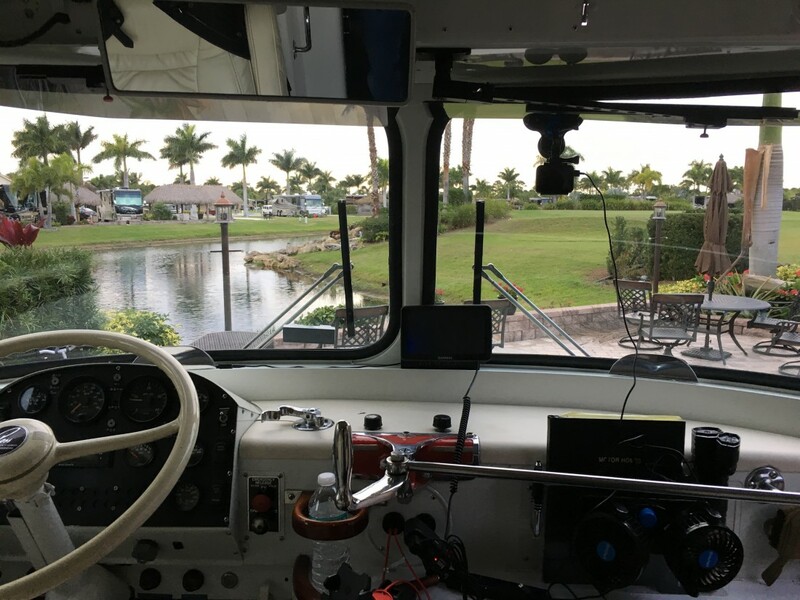 Navigating to The MotorCoach Resort at St. Lucie West is a simple task as it’s located just two miles from I-95 and all roadways, ingresses and egresses are RV friendly. The Garmin GPS guidance was 100% accurate and led me directly into the front entrance. Upon arrival, there’s an ample parking lot where even the largest coach with a car in tow can easily pull-in and park directly in front of the sales/rental office. The gate that separates the office from the resort is wide enough to leave plenty of margin for error. However, since I was traveling on a holiday weekend, a skeleton staff was in place in the management office and I was greeted with a locked door. Since the gate into the park utilizes a card entry and is not manned, I was a bit miffed on how to enter the resort. A note was placed on the front door that the attendant was currently inside the Resort. Two cell phone numbers were listed and while I tried both and received voice mail greetings, within just a few minutes the attendant arrived along with some prospective purchasers who were touring the property. The sales/rental office is clean, comfortable and features a relief map of the property. 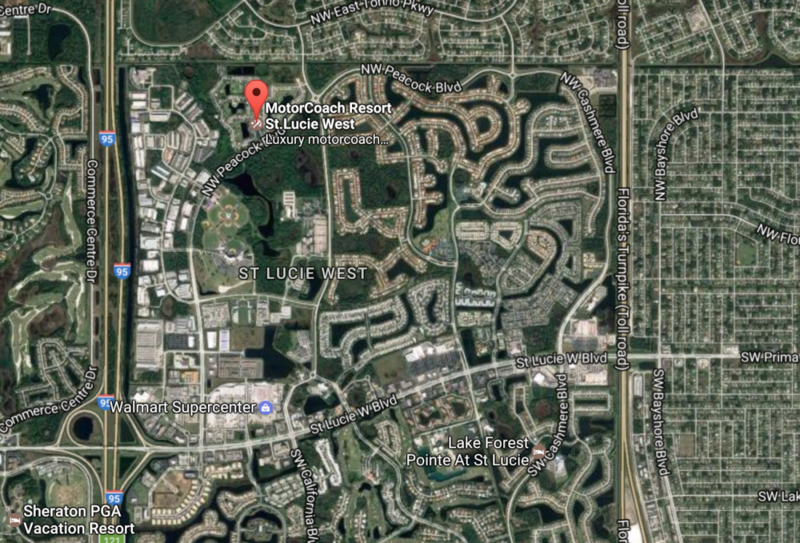 This is probably a good time to point out this property is considered to be a larger, community-style resort and consists of 401 lots, all of which are owned by individuals. This resort began occupancy in 2000 and based on the fresh landscaping it appears to be very well maintained. Based on conversations during my visit, it appears the focus of the management is resales, rentals and providing an assortment of activities for the residents and guests. However, during check-in there was a bit of confusion as the lot I reserved was showing not available in the system’s computer. 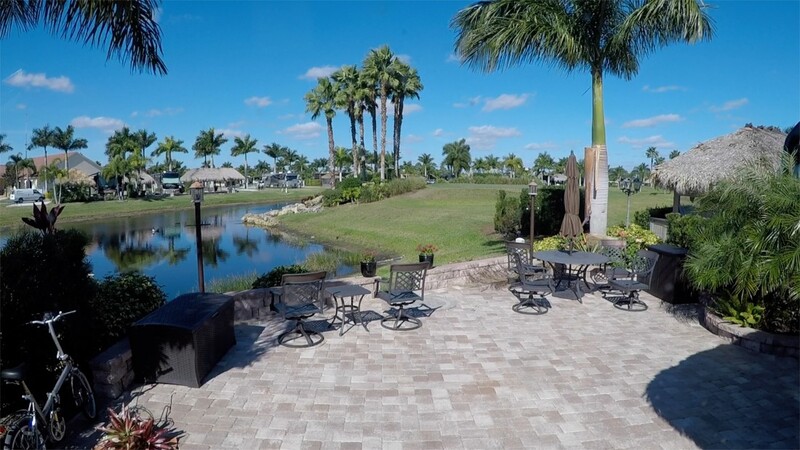 While this added to the wait time, Amy at the front desk was more than accommodating and found an available premium lot that provided easy access and an expansive waterfront view and a fully furnished tiki hut complete with all the desirable appliances. However, due to holiday staffing restrictions, since this was my first visit as a bus owner, while I was hoping to be escorted to the lot by a staff member and provided a brief overview of the various utilities, a few others showed up in the office which made this impossible during a holiday weekend. A very friendly property owner who happened to be in the office at that moment volunteered to take a golf cart to guide me to my lot for the evening. 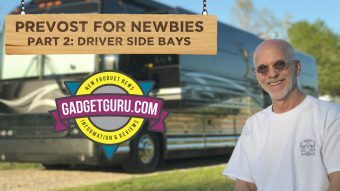 While in most cases this would be ample, I’m a newbie to motorcoach parks and I could have benefitted by a quick overview of the electrical connections. The electrical box, cable, water and sewer hookups were located exactly where they should be, but the labeling on the breaker box was a bit confusing to this rookie. Since I was staying at a premium lot that included additional electrical operations, attached to the main box was sub panel that controlled other items on the lot. To make a long story short, while I thought I had connected to the 50 amp power correctly, it wasn’t and didn’t realize my error until my bus’s low battery alarm sounded at 4:30am. It became evident that I didn’t flip the switches in the proper direction. So, with flashlight in hand, I disconnected the power cord, checked the bus’s electrical panels and fired up the generator to start charging the house batteries. I’ll underline this is surely a rookie mistake as my travels to date were during warm days and if this had not been the first cool night of the Winter season, I would have noticed something was awry when my A/C compressors didn’t fire up when the bus was initially connected to shore power. Yes, while I can run everything else on my bus with batteries, it requires either generator or shore power to activate the A/C compressors. I will point out that it was a cool evening and for the first time I was able to test the Starliner’s heating system and it worked well and at times, since the temperature dipped into the high 40’s, it worked a bit too well! But I’m still learning the nuances of this bus and I’m sure I’ll figure things out soon enough. After checking the electrical panels and scratching my head a bit I went back and tried the connections again. While it was difficult to see if the breakers were set to on or off, after trial and error I flipped the breakers to the correct position and all was well. I mention this as this inconvenience could have been avoided if I would have been shown the connections upon entry…but I’ll take responsibility for this error and apologize to my neighbors if my early morning generator startup disturbed their sleep. …the residents I encountered were kind, friendly and welcoming…there were no shortage of smiles! Speaking of the neighbors, the folks who, for the most part are property owners, could not have been nicer. If I can sum up my one-night stay at this resort I can do so by stating that when walking Lucy the Dog through the property, the residents I encountered were kind, friendly and welcoming…there were no shortage of smiles! 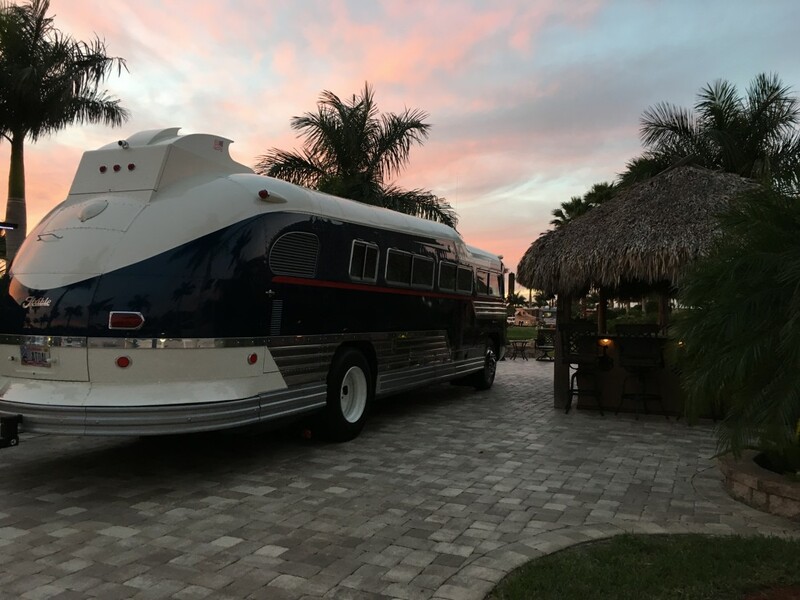 Yes, I fielded quite a few questions regarding my 1957 Flxible Starliner, but as Jim Lattimore, the previous guardian of the bus clearly told me, this bus is the ultimate conversation piece and I’ll quickly make new friends wherever I go. But as he warned, there will be a lot of questions. Jim was correct! I’ll add that within an hour of arrival, I was greeted by a Welcoming Committee Member who answered questions about the resort and provided a listing of helpful and emergency information and a detailed listing of restaurants, retail stores, diesel stations and local attractions. They also informed me of a Happy Hour that evening at the resort’s clubhouse. 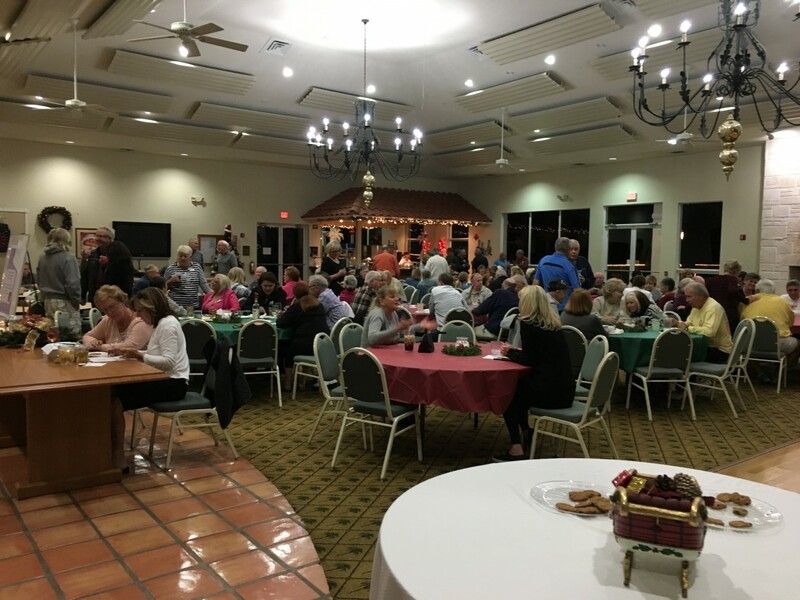 During seasonal months, the HOA sponsors complimentary breakfasts every Monday morning at 9am and a social hour every Friday at 5pm and is an excellent way to meet your neighbors. On this Friday evening I attended the social hour in the spacious clubhouse that offered free drinks and appetizers. While I arrived a bit late to sample the appetizers, the bartender was friendly and accommodating and grabbed some snacks for the bar. I’ll add this event was well attended and the folks I encountered could not have been more welcoming. Considering the following night would be the resort’s New Year’s Eve party, the turnout was even more impressive. 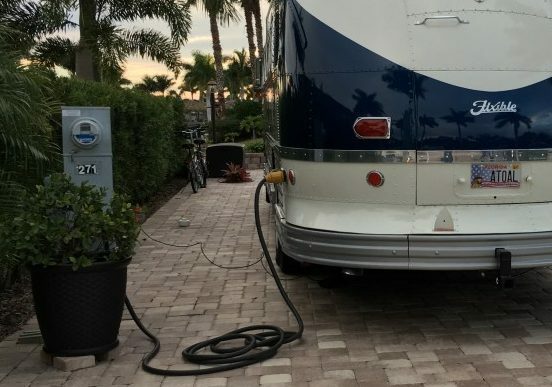 The MotorCoach Resort at St. Lucie West is billed as a Class A Motorcoach Resort and a walk thorough the property showed a variety of coaches ranging from Tiffin and Newmar to Prevost and Newell. 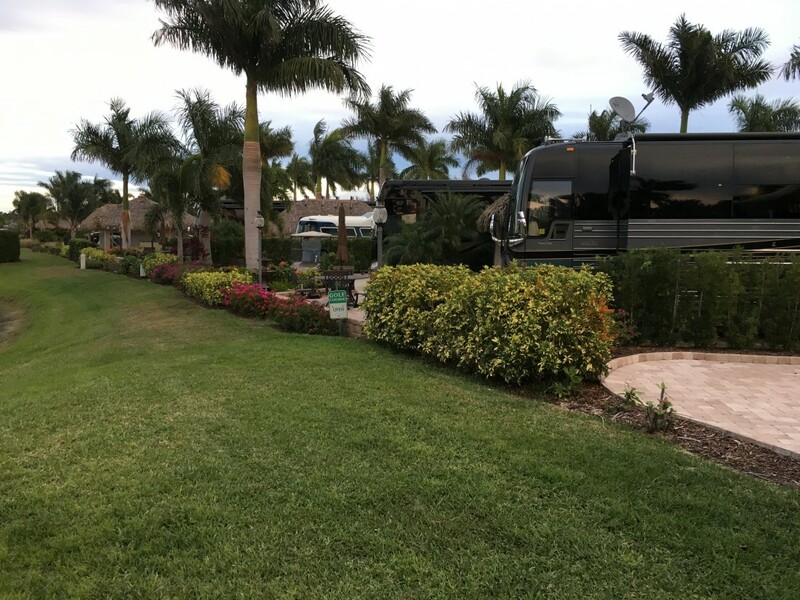 I’ll note that trailers and tow dollies may not be stored on the property and free standing satellite dishes are also not allowed.The dress code is appropriate for a top tier motorcoach resort. 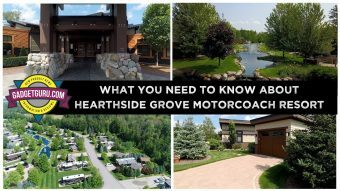 The sections I toured showed improved and personalized lots that were well maintained with lush landscaping and many with breathtaking golf course and/or waterfront views. 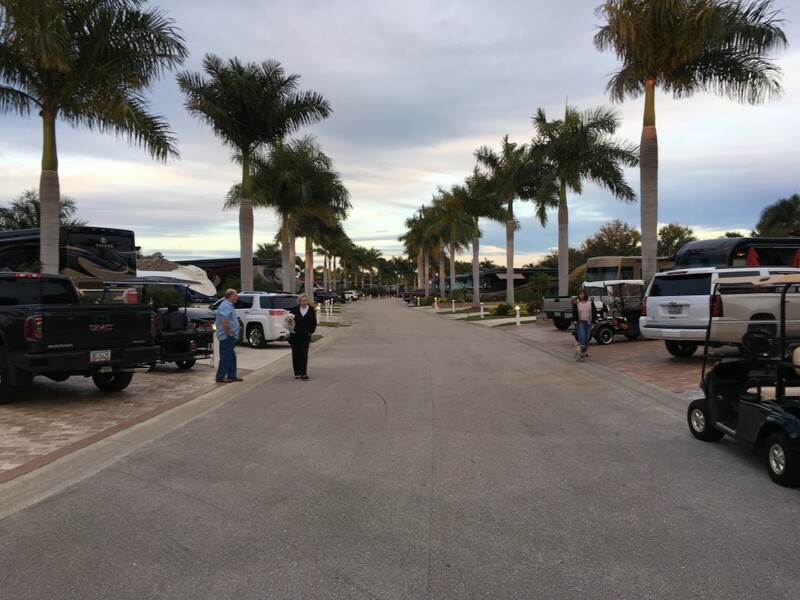 At night, the streets are lit to the point where an evening Dog walk is safe (always carry a flashlight, of course) and there was never a concern about safety within this gated motorcoach resort. 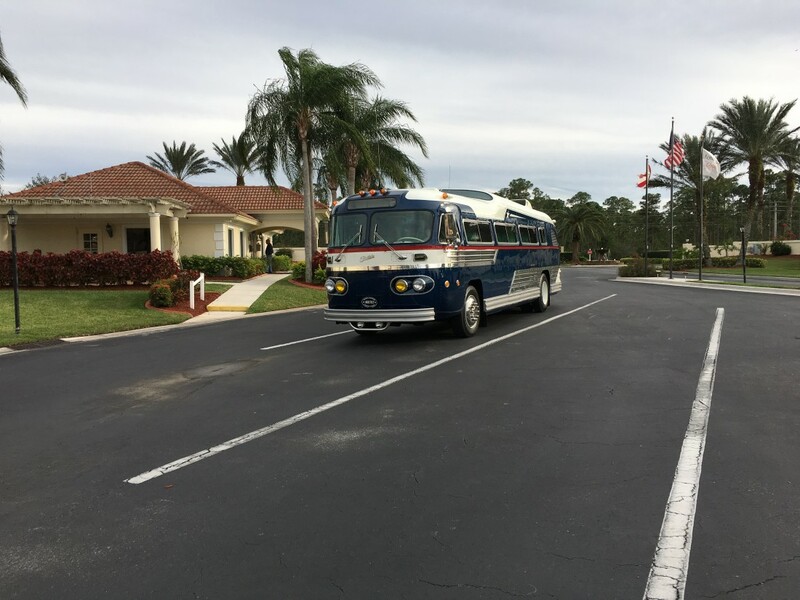 From my perspective it appeared the residents took great pride in their coaches as with very few exceptions they were clean, polished and well maintained. Based on a one-night stay I’d be hard-pressed not to recommend considering this resort for a short or extended say. The only two items that I could find fault were the lot number signs are a bit difficult to identify and no WiFi is available…at least not yet. In this day of living in a streaming video world, high speed and secure WiFi is an amenity I would expect from a top tier resort. 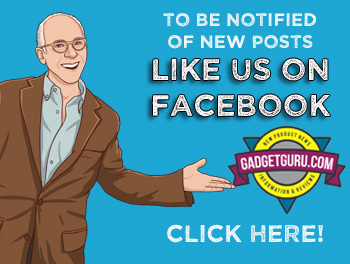 However, the AT&T cellular signal was excellent which made streaming on my various devices a pleasure. Children under the age of 18 must be supervised by an adult at all times while in the resort, clubhouse and pool areas. Up to two Dogs per coach are allowed and of course, leashes are required and common sense rules apply. 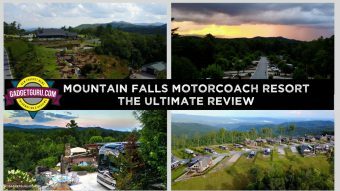 This is considered a Class A motorcoach resort and the minimum coach size is 25-feet. Coach approval is at the discretion of the management. Check in time is after 11am and check out time is before 11am. The site and furniture were clean and ready for occupancy. A copy of the bill was provided at check-in and the total price paid for the premium lot was $121. Checkout consisted of returning the gate access card. Rental rates range from $90 – $130 per night and depending on the specific lot, a minimum stay ranges from one to seven nights. All of the lots are individually owned and 86 of the 401 lots are currently for sale. Sizes of the available lots range from 2,500- to 4,700-square feet and are priced from $53,000 to $170,000, based on size, level of improvements and location. 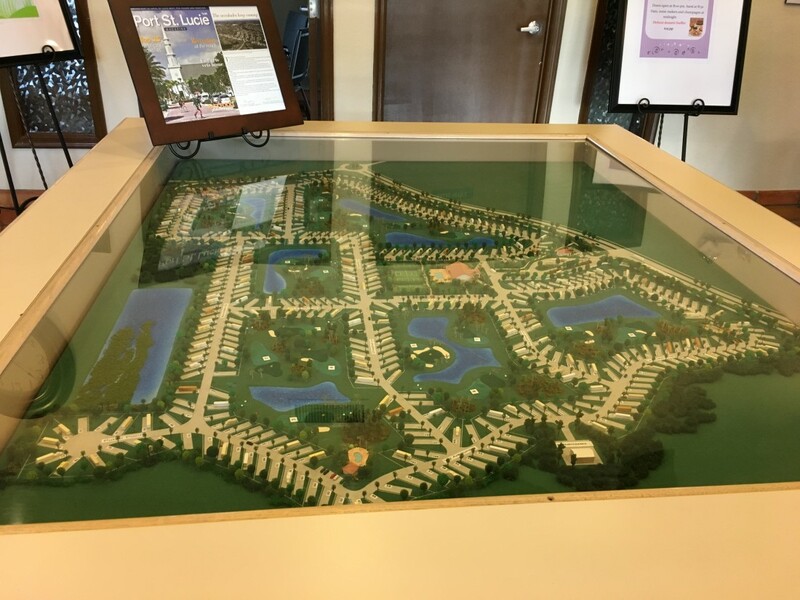 HOA fees are $833 per quarter and include all amenities including the 14 hole, par three golf course. A proposed third phase is currently under consideration. If approved this expansion would add 63 lots ranging in size from 3,900- to 7,500 square feet and allow for the addition of a casita with up to 500 square feet of air conditioned space and an additional 500 square feet of covered outdoor recreation space. No pricing or dates have been announced for this proposed expansion. Is This Resort For You? Whether it’s a brief stay or a seasonal visit, I can highly recommend this resort. The landscaping is lush and well maintained and the streets are wide and clean. Ingress and egress of the lots were performed in a single maneuver and there was no shortage of friendly folks to act as spotters when backing out. When walking the property with Lucy the Dog, the people were friendly and willing to answer any questions about the property. The residents seemed truly happy to be there and considered this park their piece of Florida sunshine paradise. I left with the feeling this is more than a resort, it’s a community that’s comprised of like minded people who are enjoying all the good things life has to offer. Simply stated, I will look forward to a future visit to this resort. So, where’s my next stop? Stay tuned as a new park review is coming soon!